Amid the bustle of Festival Circa, Compagnie 111 director Aurélien Bory talks to John Ellingsworth about new work Geometrie de Caoutchouc, science fiction and the posthuman, mathematics and art, the attraction of circus, and bodies becoming space. The director Aurélien Bory has been making work with circus artists for a little over a decade now — mostly under the aegis of the company he founded with acrobat Olivier Alenda in 2000, Compagnie 111 — and yet Géométrie de caoutchouc, his latest piece, is the first to be performed inside a circus tent. Technically, at times, it’s performed inside two tents, with the audience watching and surrounding, on rectangular banks of seating placed on four sides, a scaled-down replica of the venue they occupy. As a feat of matryoshkan set design, the staging gives a first indication of Géométrie’s intention to situate itself in a disruptive relationship with the traditional idea of the chapiteau as an icon of circus, but then Bory is not, and has never been, a traditional circus director. Since the foundation of Compagnie 111 and debut piece IJK — an acoustic and spatial extrapolation of the fundamental aspects of juggling — Aurélien Bory has made a name for himself with a series of large-scale works that explore the properties of materials and spaces to create a kind of living scenography or architectural puppetry: in Les sept planches de la ruse fourteen Chinese acrobats animated a moveable set of geometric shapes inspired by the Tangram; in Sans Objet the stage was dominated by a towering industrial robot arm (formerly part of a factory-line that assembled cars); and in Taoub, his collaboration with the Moroccan collective Groupe acrobatique de Tanger, the changing set formed and reformed from a single sheet of fabric. 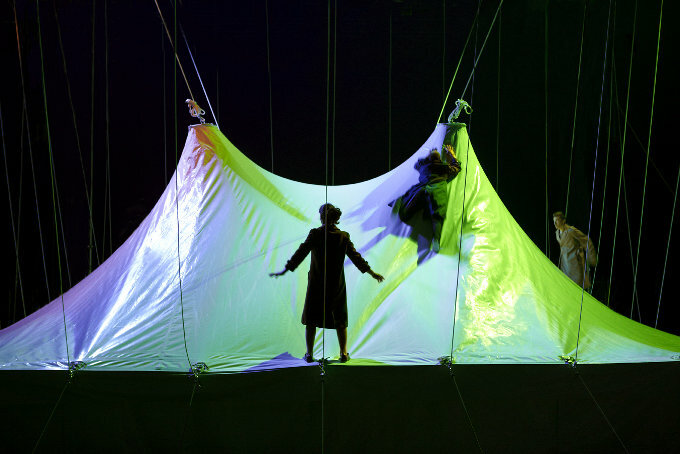 In Géométrie de caoutchouc, which premiered at Le Grand T in Nantes before heading to Auch and Festival Circa, it is the tent itself that comes to life: once the performers have emerged from inside the replica, the ropes tying it down are disengaged and the canvas flies up like a genie or rushing god, billowing and settling high above. Its face, squarish and pale, not unlike the face of a colossal heavenly owl, is animated by two metal discs with a transfixing gaze. The performers in Géométrie de caoutchouc are not always inert, but they do act passively — or allow the space to lead them. Once the new humans are out in the open we see them draw together and form a sort of proto-society, becoming like a broken memory of a working group, cooperating to perform actions which its members don’t understand. When the tent is released the performers, eight of them, each take a rope and race and fall across the stage to pull the canvas down into a sail, looking tiny and confused as they scramble amid a chaos of ropes; later, with the tent held back at ground level, they run jerkily around its edge, appearing and disappearing behind billowing canvas that receives the image of mad shadows skitting along. Always there is something disconnected in their movement that suggests they are navigating from one impulse to the next, no thoughts beyond the present action. Mortality — and, more broadly, the nature of humanity — is something that seems to lie at the heart of Bory’s recent output. Sans Objet, particularly, was a striking science fiction fable that explored the idea of machine obsolescence as a metaphor to approach the question of what qualities make a human being a human being, interrogating the assumption that humanness can be identified by a checklist of physical characteristics. In Géométrie de caoutchouc, after the new humans have released the tent and explored the stage — explored the limits of their containment — they try to go back: bring the tent to earth and crawl back under the canvas, which, its energies dissipated, lies flat across the stage. They’re where they began, but clearly it’s not the same, and can’t ever be. Aurélien Bory is the artistic director of Compagnie 111, which he founded in 2000 with the acrobat Olivier Alenda and which has produced, to date, eight productions (including Plan B, Plus ou moins l’infini, Les sept planches de la ruse, and Sans Objet) and two collaborations, Érection and Arrêts de jeu, both with Pierre Rigal. Géométrie de caoutchouc premiered at Le Grand T, in Nantes, 11 October 2011, and was at Festival Circa 24-28 October 2011. The piece is currently touring, with its next scheduled performances in France at the Cirque Théâtre Elbeuf 13-15 April 2011. In 2013 Compagnie 111 will present a new collaboration with the Groupe Acrobatique de Tanger in Marseille as part of the city’s year as a European Capital of Culture. John Ellingsworth interviewed Aurélien Bory at Festival Circa 25 and 27 October 2011 next to the Radio Circa studio/booth at the Maison du Festival (part I) and sitting in the unseasonably warm sun outside key-promoter hive Café Sol (part II).